Millar DuMars' sense of language, ingrained in the poet's attitude toward her poems, is why they can move such extraordinary distances in tone, language and theme, building to conclusions of breath-taking clarity and directness. Susan Millar DuMars will not rush sadness, but instead makes language do its poignant job of revealing and evoking strong feelings... Her style of retelling is unique; she doesn't mince her words, she spares them and makes them work. Susan Millar DuMars was born in Philadelphia in 1966. She holds an MA in Writing from the University of San Francisco. Her poems and short stories have been published widely in the US, UK and Ireland. Her poetry was included in the 2004 Anthology I, published by Ainnir; in 2005, Lapwing published a pamphlet of her poems, the well reviewed Everyone Loves Me. Susan's stories have been short-listed for many awards, and in 2005 she received an Irish Arts Council Bursary for her fiction. American Girls, a volume of her short stories, was published by Lapwing in 2007. Susan lives in Galway, Ireland. Since 2003, Susan and her husband Kevin Higgins have organised the successful Over the Edge reading series, showcasing new writers. 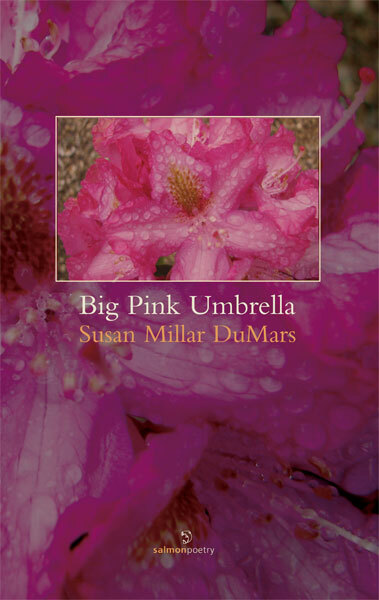 Big Pink Umbrella is the first full collection of her poetry. Sighing on the third stair. I'm busy just to mock you. Reading 'Big Pink Umbrella', the first collection by American-living-in-Ireland Susan Millar DuMars, is rather like standing before one of those extraordinary self-portraits painted by Picasso or Orpen. There's an accumulation of information that adds up through a mélée of shards. In this one collection, this single painting, we have a sense of Millar DuMars past and present, of the symbols and recurring themes of her life, so that overall we are awed, disquieted, shaken to the roots; and then healed? The trees point and laugh. a face glad to see me. This process of self-portraiture is brutally honest; Millar DuMars hangs up the faulted flesh of her own self in a way that is quite merciless. We're drawn to feel empathy with her struggle and tenderness toward her being, but our ultimate response is: 'girl, you are so much more than this.' There is also the hovering question: is poetry the place? Have the borders between art and therapy become just a little too blurred? Still, this is a first collection, where it may just be permissible to get all that stuff off the chest. But in Big pink Umbrella this stuff is Picasso's grossly, exaggerated nose, it is the peculiar expression on Orpen's face, and if we're not careful as readers, it not only eclipses everything else in the painting, it also eclipses the poet's own talent as a painter. Millar DuMars is so much more than her biography. She is a short story writer and her gift for narrative, for the way prose is pushed along by the careful arrangement of words, seeps into her poems, pushing back the boundaries of form. a name is called, twice. She grasps the minimalism that electrifies dialogue, and she describes ancillary characters vividly. Adjectives are her friends, like spiders she keeps them in her house, ornamenting lines, spinning up admirable structures. 'My Husband, the Great Poet' is as dear and genuine a love poem as you will read anywhere, and a fine example of the way Millar DuMars walks the tightrope strung between the House of Mirth and the Temple of Poetry-and gets it right. Her wit isn't performance, it's another aspect of Millar DuMars standing in her own strength. 'Poets are Just like Everyone Else' and 'Hampshire College Halloween' further display her somewhat suppressed, mercurial voice. is this aisle I'm on. and it's the wrong note, a mistake because elsewhere there is the "Wellspring Wife" "licking at foundations", biding her time, able to "shape stones/quench thirst". This is a woman who can "rearrange the sky", she just doesn't seem to know it. Someone really ought to tell her..
Reviewer Grace Wells is a British poet living in Ireland. Her poems have appeared in the Autumn 2007, Spring 2007, and Winter 2006 issues of Contrary.